All of these rivers vary greatly depending on water flow and rapids can easily change a full class rating or more. Many of the difficulties on the various rivers can be avoided but you need a good knowledge of the river to avoid them. If that isn't enough encouragement, there are water falls that you will want to know about as well. Even on gentle rivers, be aware of sweepers and log jams that can pose a serious hazard. Always check your guidebook and know where you are on the river. This is a rough guide to the various areas available to paddlers. A good guidebook and thorough paddling knowledge is essential. These waters are glacial fed and dangerous to swim in for long periods of time. A very scenic river with easy access, great fishing and lots of wildlife making this a great relaxing float. 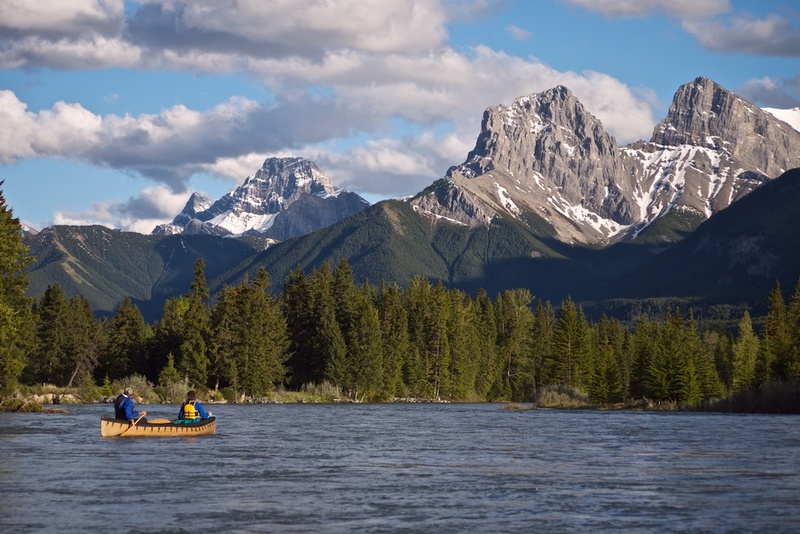 The entire Bow River from Lake Louise to Calgary offers great paddling opportunities for long distances. This reach still requires intermediate skills due to small channels containing sweepers and log jams. 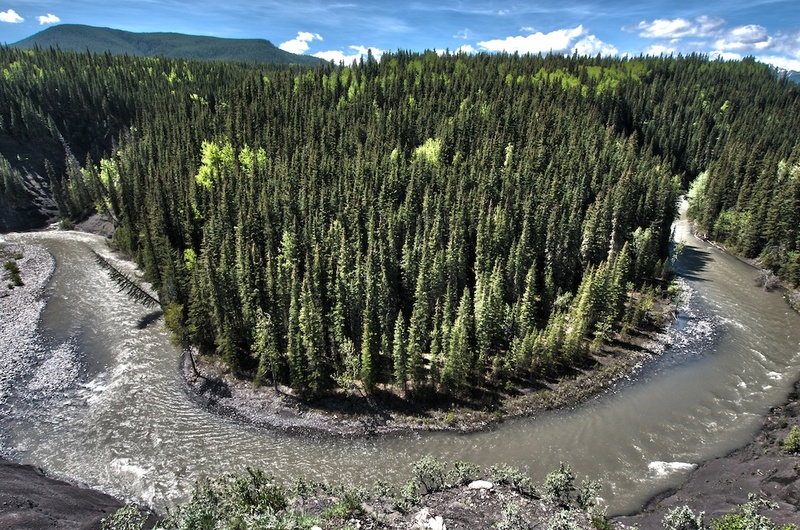 A log jam upstream from Dead Man's Flats blocks access from Canmore. As well, the river between Seebe and the Ghost Reservoir involves class V+ rapids and several dams. B: Take out at the Kananaskis River junction south of the Bow River bridge. A whitewater playground with easy access to fun features for practicing on. This river can be run year round with consistent flows from the dam. Class II-III+ rapids form between the Widowmaker and Canoe Meadows with well known features including Santa Claws, Hollywood Hole, Turbo, Pointe Break and the Green tongue. From below Canoe meadows to Seebe, the river is straight forward and great for intermediate paddlers. A surprisingly exciting river that can be overly exciting depending on water levels. Enjoy fast shallow water from start to finish with lots of rocks to dodge. 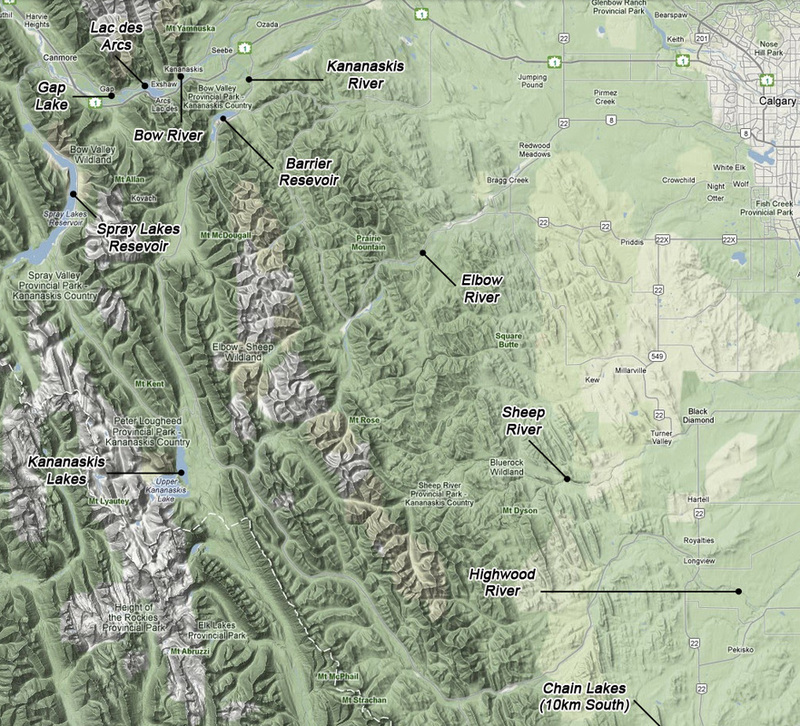 Advanced paddling skills needed from Canyon Creek to Paddy's Flat and intermediate below Paddy's Flat. 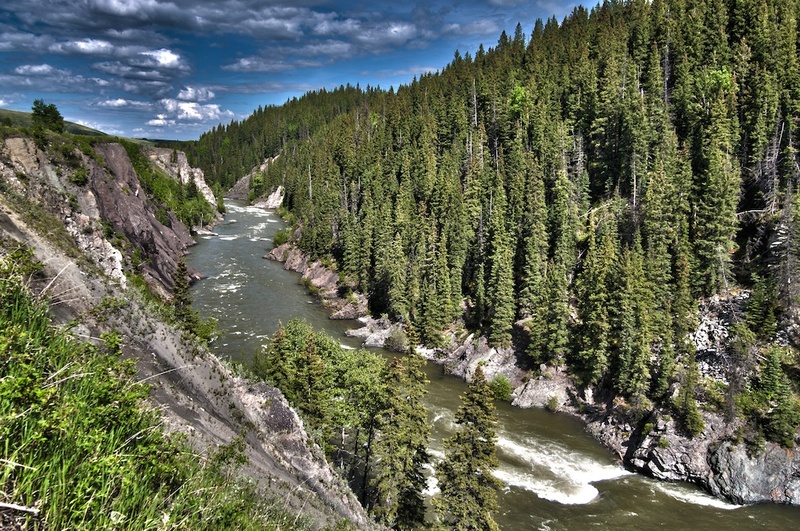 For the white water enthusiast there is a section of intense water up to class IV starting at Elbow Falls. More and more people appear to be running Elbow falls as well. A short drive from Calgary and a beautiful area to float through. River flow fluctuates significantly. 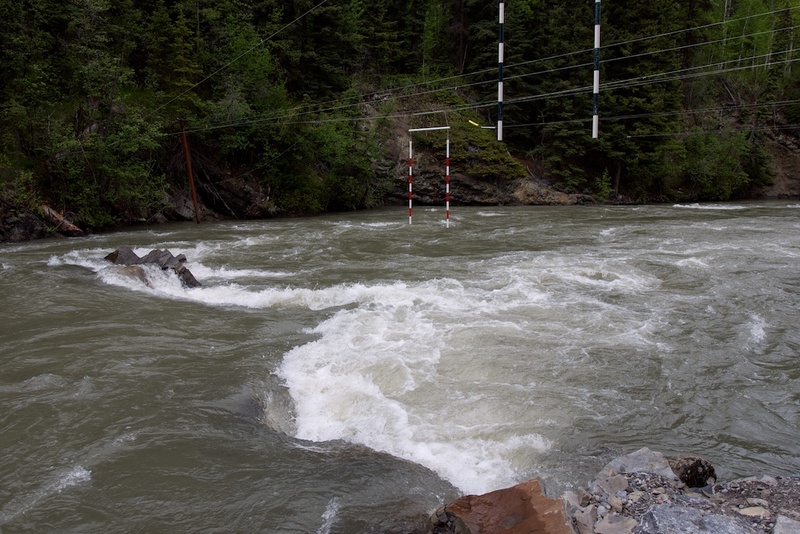 A: Put in at Elbow River Boat Launch across from Ing's Mine road, 16.2km west on Hwy 66. An amazing area centered around a beautiful river lined with black banks and wildlife. Like most eastern slope rivers, this river also varies greatly with river flow. It is possible to run the river from gorge creek for skilled whitewater paddlers. 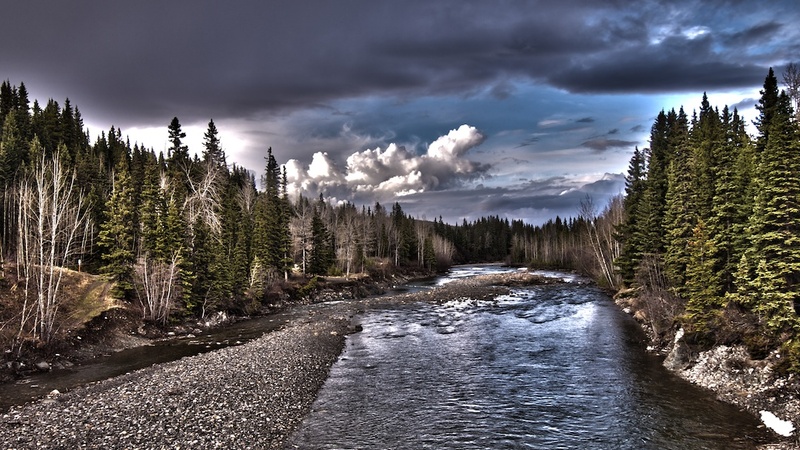 A beautiful area to visit and a fun river to play on close to Calgary. A great river during the spring runoff with exciting play areas around every corner. Located in a beautiful area away from all the crowds. Experience the rolling foothills from below, deep in the river valley that winds through this western cowboy land. Upriver, there is extreme white water up to class V for the adrenaline seekers. A: Put in at a small pull off 10.3km west of Hwy 22, half a km west of Ings Creek Bridge. There is a barb wire gate and a very steep embankment down to the river.